An NTSB study into five accidents on US railway (‘railroad’) Metro-North gives a unique perspective on organisational accidents. Metro-North was described as having an “invisible safety department”, that kept its SMS on the shelf until external audits and assumed on-time performance would give them safe operations. Metro-North is the second largest commuter railroad, and one of the busiest, in the United States. 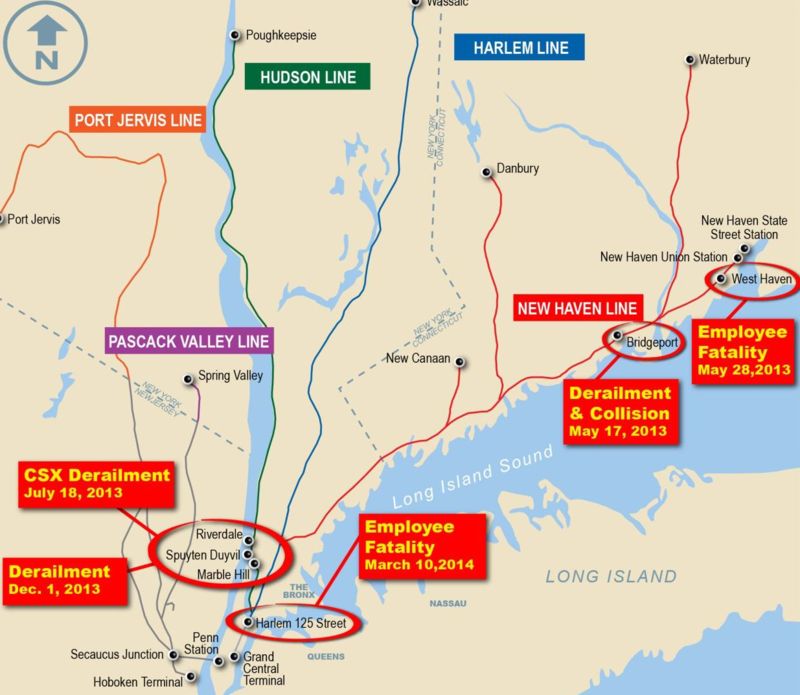 Between May 2013 and March 2014 Metro-North had five significant accidents resulting in 6 fatalities, 126 injuries and more than $28 million in damages. In November 2014 the US National Transportation Safety Board (NTSB) published a special investigation report into the organisational factors that emerged (discussed at a special hearing). This series of accidents is also covered in an excellent DisasterCast podcast by Drew Rae. 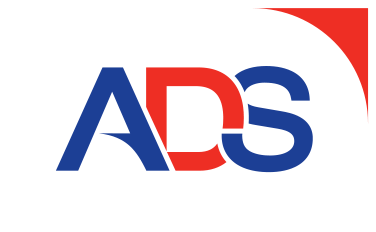 …coordinate a safety system for prevention, identification and management of hazards in an effort to minimize safety risks to both customers and employees. Metro-North’s commitment to the SSPP will permeate every aspect of railroad operations. NTSB investigators found little evidence that Metro-North systematically followed…procedures as described in the SSPP. Moreover, the NTSB investigators found no evidence that Metro-North actually used the SSPP as part of is operational guidance. Aside from senior management personnel, most of the Metro-North employees interviewed by NTSB investigators stated that they had never heard of or seen copies of the SSPP. …actually used to just reside out in the hallway there in the file cabinet. It would take up the whole cabinet, all of the appendices in it. The Metro-North SSPP appears to be classic safety ‘shelfware’. A document created to be primarily read only by outsiders with little influence on safety practices within the organisation. It wasn’t the only sign of poor documentation. The NTSB note that the organisation’s medical protocols for train drivers had been last revised in 1995, refer extensively to “use of sound clinical judgement” without further guidance and tended to focus on occupational illness rather than human performance. In particular the NTSB note there is no coverage of sleep disorders, an issue contributory to one of the accidents. The SSPP was not the only safety ‘program’ however. I look back and really the whole safety area was a product of what DuPont made it. And I can’t tell you that there were many changes from the time DuPont’s contract ran out, okay, up until the current time. I mean…everything was running fine. You know, there was no reason to change the policies that were in effect then. …most of the employees interviewed were unable to describe the Priority One safety program beyond recognizing it as a slogan that appears on posters and brochures with the railroad’s logo. The program was intended to use structured layers of safety committees to facilitate a shared understanding of safety risks throughout the various layers of the organization and feed unresolved safety concerns upward through the organization for resolution. Meetings were intended as a tool to allow the district safety groups to speak directly with the president about safety actions plans and needs. These are your numbers, this is what you did, this is how well you did, and these are the good things you’re going to do…they would call it a dog and pony show…there was never a lot of good conversation. …records provided to the NTSB indicated that during the 12 months from June 2012 to June 2013, the Metro-North safety helpline only received one call—two first aid kits required restocking. When asked at the NTSB’s investigative hearing what action was taken against the RTC [rail traffic controller] who inadvertently removed the blocking devices in connection with the West Haven fatality, the Metro-North deputy chief of train operations stated he was removed from service and assigned 30 days of discipline, 10 days of which was re-instruction. This type of response to an unintentional mistake could have a chilling effect on employee reporting. …employees interviewed following the employee fatality in Manhattan on March 10, 2014, expressed reluctance to report their safety concerns and exercise their authority to make a good faith challenge for fear of being “blacklisted” or being the target of retaliation from foremen, supervisors, and department heads. 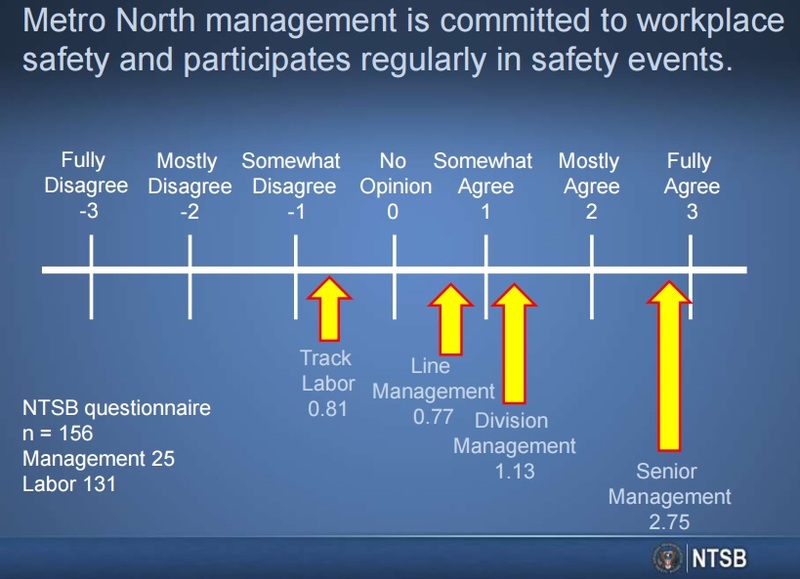 In response to an NTSB survey, most Metro-North management personnel agreed with the statements “Metro-North management is committed to workplace safety and participates regularly in safety events” and “management does not pressure staff to maintain service or operations, potentially at a cost of safety.” However, most of the responding rank-and-file employees disagreed with those statements. This disconnect is a damning indictment of safety leadership within Metro-North and suggest either a management ignorant or deluded on the state of their organisation. NTSB concluded that Metro-North did not successfully encourage its employees to report safety issues and observations. Their SSPP/SMS does not seem to have had the capability to detect the early warning signs of impeding failure, as described in Barry Turner’s ground breaking research on Man Made Disasters. Last year we looked at this topic in our article Disasters and Crises – 10 Lessons on Early Warning. 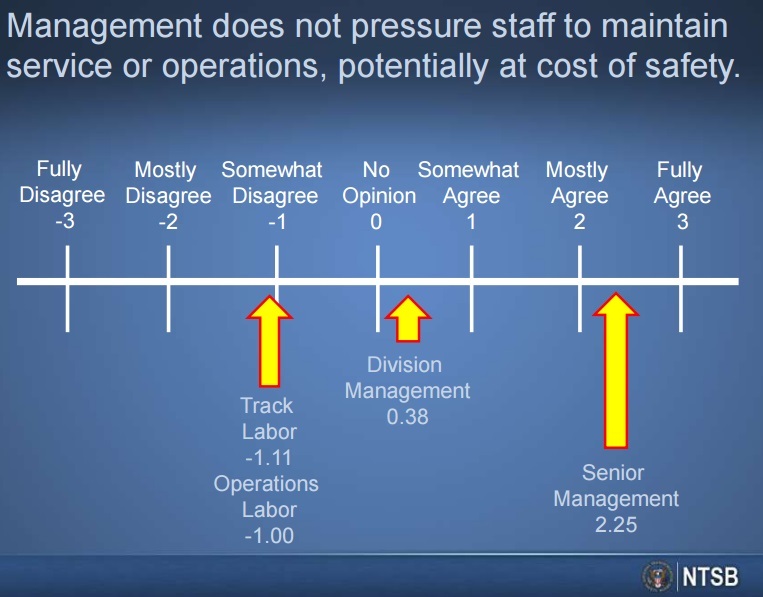 …there seemed to be an obsession at Metro-North with on-time performance—so much so that Metro-North management came to believe that on-time performance could be an effective metric of the health of the system. According to an NTSB interview with Metro-North’s senior vice president of operations, “We were geared towards using the on-time performance numbers as a metric. The philosophy was that if we can deliver trains on time, all of the supporting activity that we did, track maintenance, signal maintenance, and rolling stock maintenance must be performing well if we can deliver that high degree of service reliability.” To use on-time performance as a metric of system health is a flawed assumption, because it overlooks the age-old conflict between production and safety. With the flawed assumption that train operational safety was being monitored by monitoring on-time performance, safety seems to have been seen as an occupational safety issue. Priority One, the core component of the wider SSPP, was focused only on employee safety, not on safe operation of trains and the safety of the travellers who made 83 million journeys on the Metro-North network each year. So for example, other data, such as a trend of track joint bar failures was not being identified because according to the NTSB, Metro-North was “failing to analyze and act on its own data”. One reason was that a lot of track inspection data was still paper based. Reliance on lost-time injury data in major hazard industries is itself a major hazard. …found no indication of the safety department being involved in operational or process safety functions. Testimony…indicated that the safety department was not historically involved in risk assessments for operational decisions. When changing from a four-track system to a more intensely used two-track system in the Bridgeport derailment area, no formal risk assessment process was used, nor were changes made to the maintenance procedures in response to the increased load. Internal safety investigations were limited. On 4 May 2013 a train was mistakenly cleared into an area were track workers were working. They escaped injury and the occurrence was reported (though not it seems on the Priority One phone line). However the investigation produced just a 1 page timeline, with no conclusions or recommendations. On 28 May 2013, in similar circumstances, a track foreman was killed. Even when improvements were made, they inadvertently heightened risk because of inadequate planning. Supervisors were, for example, meant to monitor the performance of Foremen in applying track protection procedures. Having identified that the Foremen were poor at this, it was decided that pending further training only Supervisors would be authorised to control track protection. But no monitoring was then put in place to ensure the Supervisors were effective at it. When asked about internal audits, the chief of the Safety Department responded: “I don’t think we ever really did (them).” It is no surprise that the department was described by employees as “an invisible department” that “printed brochures”. The NTSB report paints the picture of an organisation with a weak safety culture, that valued on-time performance so highly that it assumed its safety performance must be satisfactory. Safety processes were assumed to be working and in need of little attention, when in fact they were ineffective or missing. The SSPP was ‘shelfware’ cynically updated before external audits by a dysfunctional department that was described as ‘invisible’. “lamentable job from start to finish”, “fatally undermined by a general malaise”, “virtually worthless as a safety tool”, a “tick box exercise”, “languishing on-the-shelf”, “giving people a false sense of security “, in a “culture of paper safety”. UPDATE 27 July 2015: This accident also has implications for the evolving concept of Performance Based Regulation (PBR). 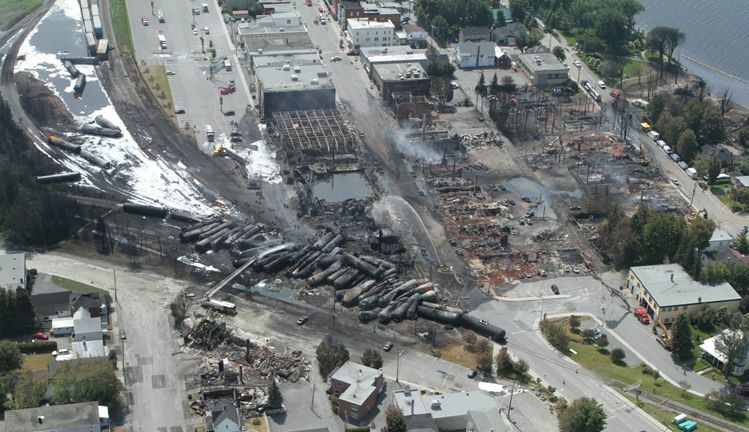 We discuss these further in a follow up article: Performance Based Regulation and Detecting the Pathogens that also looks at the crude oil train derailment and fire that killed 47 people at Lac-Megantic, Quebec, Canada. UPDATE 3 May 2016: The US National Transportation Safety Board (NTSB) discussed safety culture and a failure to learn at a hearing into an accident at a Board Meeting on a Washington Metrorail (WMATA) smoke and arcing accident that occurred on 15 Jan 2015. UPDATE 19 September 2016: It’s worth listening to Todd Conklin’s podcast interview with Prof Ed Schein. UPDATE 16 February 2018: Quebec’s Director of Criminal and Penal Prosecutions will not appeal the not-guilty verdicts reached by the jury on the three rail workers in the Lac-Mégantic accident.